29 74550-2689 - 7/16 Round/axle Bushing (black). 21 74540-4419 - Battery Retainer. 56 73233-2279 - Taillight Lens Set. 36 0801-0221 - No. 6 X 1-1/2 In. Screw. 19 73233-9339 - Headlight/guard Assembly. 76817-CCCC - Use & Care Manual . 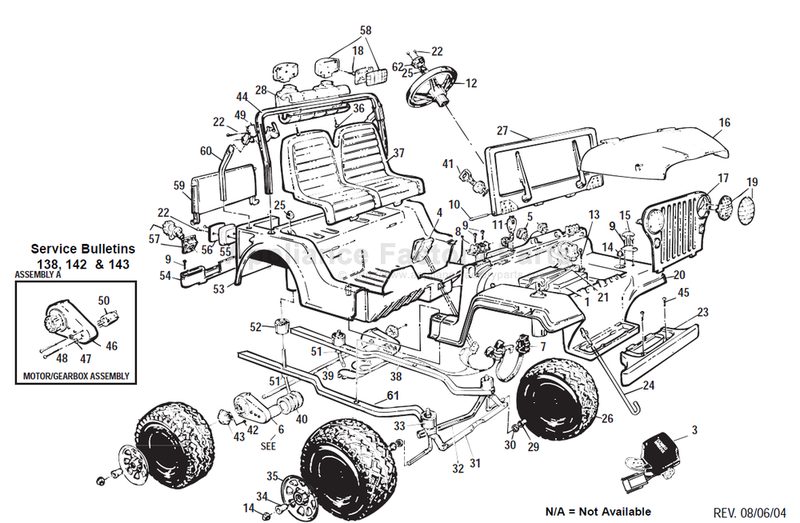 32 76817-4159 - Front Bumper Support. 55 73233-2759 - Taillight Housing Set. 41 73233-2439 - Key Assembly. 8 73233-2779 - Windshield Hinge Set . 16 76817-2359 - Hood . 20 76817-2239 - Front Body . 27 73233-9639 - Windshield Asmbly . 28 74440-2059 - Kc Light Rack . 31 76817-4229 - Steering Linkage . 33 73233-2539 - Front Post Bushing . 39 76817-4559 - Rear Axle Asmbly . 49 73233-2179 - Roll-bar Bracket Set. 52 73233-2549 - Rear Bushing . 53 76817-2249 - Rear Body . 57 73233-9249 - Gas Cap/flange Assembly. 59 73243-2129 - Tailgate . 60 74450-2249 - Roll-bar Support Tube . 73243-6059 - Decal Sheet, Windshield . 80017-0049 - Decal Sheet, Headlight . 74540-0300 - Main Decal, Sheet. 25 0801-0604 - .354 Black Retainer/cap Nut.